The key to happiness, control, and avoiding dinosaurs who want to eat you. Nostalgia isn't what it used to be, in fact with Jurassic World (2015) it may just be better! But does nostalgia make for a great film? Essentially sidestepping The Lost World: Jurassic Park (1997) and Jurassic Park III (2001) Colin Trevorrow's Jurassic World is presented as a direct sequel to Steven Spielberg’s monster-sized hit film Jurassic Park (1993) based on the Michael Crichton 1991 book of the same name. This new film picks up some twenty years after the chaos and mayhem of the failed attempt to open a dinosaur theme park to the public, complete with living breathing real dinosaurs. Like the original film, Jurrassic World’s story revolves around what happens when mean dinosaurs get loose and how people cope with what looks like an uncontrollable situation. Jurassic World, the fictional dinosaur theme park on the island of Isla Nublar off the coast of Costa Rica, has been open for businessfor around ten years. Market research has shown the public is becoming jaded and regard dinosaurs the way they do elephants and other wild animals in zoos and safari-style game parks. To remain profitable the park scientists, headed up by Dr. Henry Wu (BD Wong), and the park's management feel pressure to exploit their genetic research to entice, secure and please outside corporate sponsors. Without the gentle idealistic guiding hand of thepark’s grandfatherly previous owner, John Hammond (Richard Attenborough), the current management has fallen prey to the twin terrors of trying to please corporate interests and public opinion. This approach leaves the island and its guests poised on the edge of danger and disaster. Claire Dearing (Bryce Dallas Howard) is the park’s on-site manager. She begins the movie as a rather emotionally cold corporate administrator focused on work much to the detriment of her personal life. 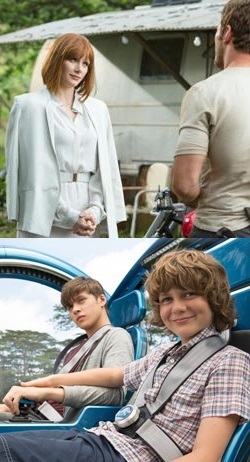 As the film unfolds Claire's more maternally-minded sister, Karen Mitchell (Judy Greer), sends her sons, Zack (Nick Robinson) and Gary (Ty Simpkins), to visit their Aunt Claire for some family bonding time on the island. Busy with crisis after crisis revolving around Jurassic World's newest dinosaur, Indominus Rex, Claire puts Zack and Gary into the hands of her personal assistant from whom they manage to slip away. Claire is accustomed to order and dislikes anything that interferes with her control of any situation. Claire works for Mr. Masrani (Irrfan Khan) a friend of the late John Hammond and Jurassic World's new owner. Masrani always wants to know if his guests are having a good time and if his dinosaurs are happy. This leaves Claire at a bit of a loss as she looks at the theme park’s guests as statistics and the dinosaurs as assets. While piloting a helicopter to the Indominus Rex enclosure Mr. Masrani says to Claire, "The key to a happy life is to accept you are never actually in control." This line is the moral of the story, the driving force behind the action. It also propels Claire's character arch, thoseof her nephews,and of Owen Grady (Chris Pratt), a researcher studying Velociraptor behaviour. Where the 1993 film Jurassic Park struggled with questions of whether scientists should monkey around with bringing dinosaurs back from extinction, Jurassic World only pays lip service to these questions. Characters briefly mention a personified "mother nature" as a creative force and millions of years of evolution, but these comments have little to do with real science or philosophy. What about religion? The name of Jesus shows up in the film but only in the form of an expletive. For audience members looking for a thought-provoking film about evolution, genetics or creation there is not much here. That said, Mr. Masrani's comment which frames the whole film begs the question, "If I'm not in control, who or what is? Or might there be nothing in control of anything?" The Christian worldview believes events take place under God's watchful eye and He is providentially active in the lives of people and the natural world while allowing hubris-driven events motivated by human desire to unfold. Like the film’s flashy CGI effects, science, philosophy and religion are only painted onto the story’s surface. 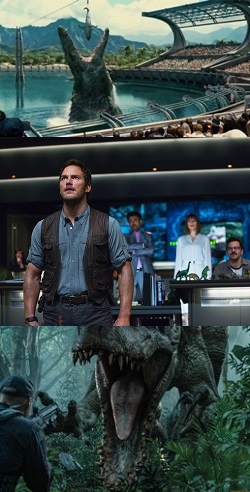 At its core, Jurassic World is really focused on Mr. Masrani's comment, regarding happiness and control. As the film progresses a question related to this comment starts emerging: Will the these characters end up happy? And if they do, will they end up happy because they have embraced this idea? Some viewers who think past the action and dinosaurs may be led to ask themselves the same question. 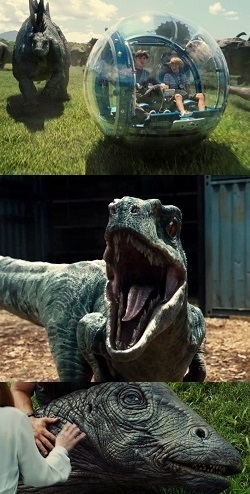 Dealing with control is one thing when it comes to romantic relationships and family life struggles, but what about when what can't be controlled is a genetically engineered, Frankenstein-like, monster-of-a-dinosaur Indominus rex that was cooked up in a laboratory and is coming to hunt and kill everything in its path? Pitting these plots against each other provides the film’sdramatic tension and suspense. Is Jurassic World as suspenseful as the first film? No, but it’s hard to compete with Spielberg who made films like Jaws (1975), Raider's of the Lost Ark (1981), and Saving Private Ryan (1998). Still, with Jurassic World the audience gets a little Spielberg fix. As executive producer Spielberg's fingerprints are everywhere, particularly in the seamless attention to detail that ties together the two films so tightly and gives the new film such a strong nostalgic feeling. 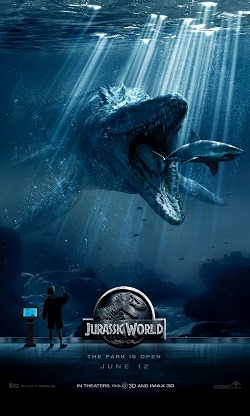 With Spielberg in Trevorrow’s corner Jurassic World cleverly incorporates everything from a vintage Jurassic Park T-shirt to original set pieces and even some of those iconic park jeeps from the first film. Spielberg is very good at nostalgia; Trevorrow has some catching up to do in the suspense department. While the brothers Zack and Gary don't come off nearly as charming or terrified as the children in the original film and the budding romance between Claire and Owen will not satisfy the most critical viewers, it’s hard to fault a movie that displays strongly the value of the family bond in the face of adversity and a willingness to stick together in crises. When it comes to the dinosaurs, the question of Jurassic World isn't whether humans should bring them back from extinction, but rather when they have been brought back what will humanity do with them? Are they only for entertainment? Are they to remind humanity of their place in the world? Are they to be weapons bred for the battle field? A word of caution. Even with a PG-13 MPAA rating there were many young children in the theatre and, while Jurassic World may not be as suspenseful as Jurassic Park, there are moments that may have been too frightening for them. Along with a number of jump scares, there is ascene with Pteranodons and Dimorphodons flying around pecking at and eating tourists like birdseed. Also, the Velociraptors that Owen Grady studies and trains can be menacing. For the most part the film is not a petting zoo: think Sea World meets Disney Land at a wild African safari park with dinosaurs. This film is pure science-fiction with the emphasis on fiction. For those new to the series it should whet the appetite for more; for those who were around for the first film it is a fun bit of nostalgia. It’s not a great film but certainly very good. That Trevorrow is a fan of the original shines through clearly. As to Mr. Masrani's comment, "The key to a happy life is to accept you are never actually in control," Christian viewers will want to turn to the first commandment and remember that whatever life throws at them the best thing to do is to fear, love, and trust God above all things. Regardless of what humanity can produce in a laboratory or put on a movie screen, it is God who made us and all creatures and He richly provides for all He has created. Remembering that it is all in God's hands and people are but stewards will provide what is needed for a happy life. When looked at through this lens, management and control of God's creation along with a desire to embrace the responsibilities of life and family need not be a burden to happiness.